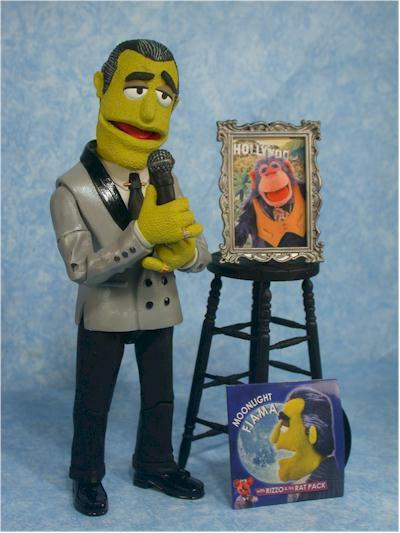 The latest wave of Muppets figures has started to show up at Electronic Boutique stores, and will be at Toys R Us stores any time. Unfortunately, you won't find this wave at Target, but perhaps they'll come to their sense by the Fall reset. We can always hope! My thesaurus is completely worn out looking for words to describe this line on an on going basis. Palisades continues to do work unlike any other company, especially with animated lines. With Ren and Stimpy, Fairly Odd Parents, Pink Panther and Invader Zim coming out this year, they'll cement their position as THE company to handle any sort of cartoon property. 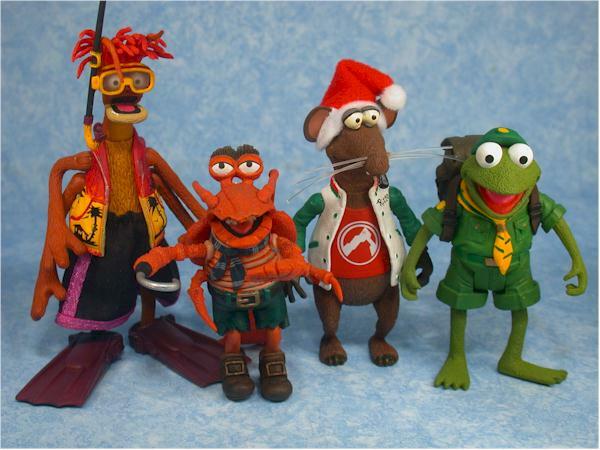 This wave consists of Johnny Fiama, the Italian singer from Muppets Tonight (actually three versions of him, each a repaint of the other), Beauregard, the lovable stagehand from the Muppet Show, Kermit as Captain Smollet from Muppet Treasure Island, and Frog Scout Robin, Kermit's nephew from the Muppet Show. They retail for $9 - $10, depending on the retailer. I suspect we'll see them very soon at the Musicland family of stores, and I have some other on-line options for you at the end of the review. If you've been paying attention, the clamshell packaging will be no surprise. It looks good, shows off the figures and accessories nicely, has great text on the back, and excellent graphics. I do notice on mine that the sticker on the front of the bubble appears washed out. As you'd expect, the sculpting is once again amazing. I've noticed that 'amazing' is a word that gets over used with this line, but it's hard to find a better word to describe the ultra attention to detail. I knocked Beau a little because his figure isn't quite the same level of detail and perfection as the others. The skin texture, especially on the head, didn't come out quite as perfect as the others, and the facial expression doesn't do too much for me. But even he is playing in a whole different ball park than other lines by other companies. Now lets talk about the rest of this line. Robin has an amazing expression, happy and innocent, with excellent work on the uniform and overall body sculpt. He stands great on his own, doesn't look like he'll have weak leg issues, and has proper hand sculpts to hold some of his accessories. I hadn't expected to like Johnny a whole lot. 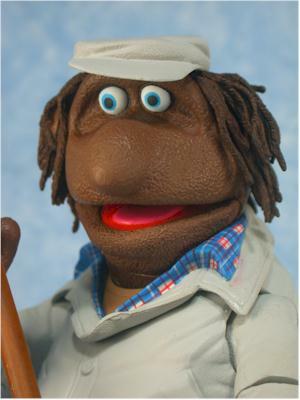 I'm not a big Muppets Tonight fan, and this character never did much for me. But in the hands of the right artists, this figure leaps off the shelf. First there's his expression. With the tilted eyebrow, half open mouth, and lidded eyes, he has the perfect smarmy expression for just about any pose. The body is sculpted and articulated for most basic standing poses, and the hand sculpts fit the character perfectly. And the microphone fits the right hand just as perfectly. For a character I wasn't really looking forward to, he quickly leaped to the front of the line. Then there's Smollet. 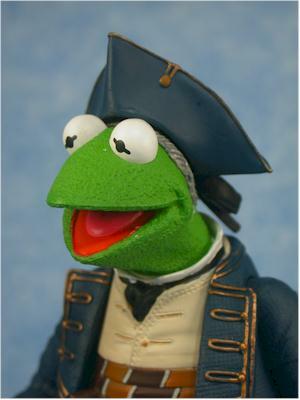 This is Kermit in his outfit from Muppet Treasure Island, and while there are a couple minor issues, it's clear that Bill Mancuso is the man when it comes to sculpting Kermits. 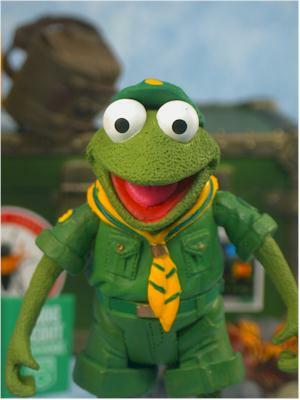 Just like Adventure Kermit, he's managed to capture the essence of frog in plastic form. Every detail is included in his outfit, right down to the button fly. The kind of fly in his pants, not one he would eat. I do have a couple issues with him, as I mentioned. The sculpt and articulation don't work quite as well together as I'd hoped, and the hair and hat don't fit together quite as neatly has they have on previous figures. But overall he's still an amazing looking sculpt. The scale across these figures seems fairly accurate to me, and Robin fits in nicely with the other small figures. Beauregard is close to Fozzie in size, and Kermit matches up with the other Kermits. I looked over two complete sets of these figures, including all the Johnny repaints, and couldn't find a single major problem. There were a couple minor ones - a rub mark here, a slightly fuzzy line between colors there. 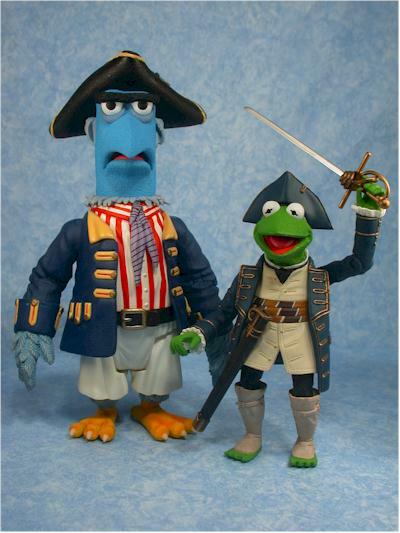 But in general, it is one of the best paint jobs I've seen on a Muppet series so far. The two figures with the greatest amount of complicated work are Smollet and Johnny. Both have excellent small details, great color separation and consistency, and clean lines. It's worth talking about the Johnny repaints here. 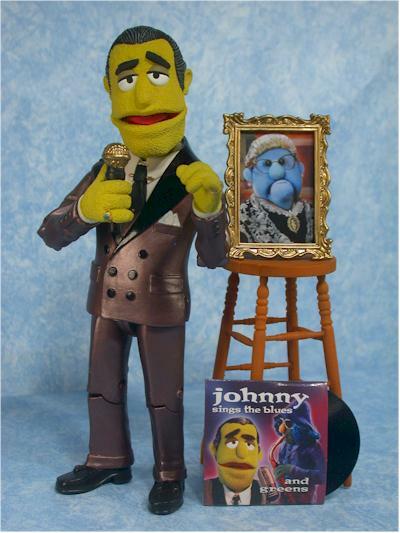 There are three Johnny figures, all identical except for minor variations on the accessories, and very different paint ops. All the accessories are a different color, even the basic stool. 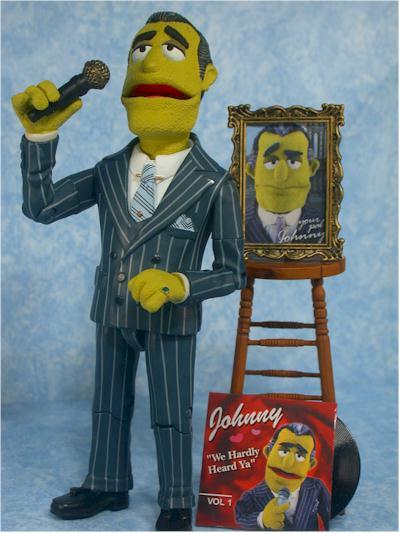 Johnny comes painted in three outfits - pinstripe suit, 'wedding singer' suit, and a one color suit that looks like silk. The sculpt works great with all three paint schemes, and they've included important details, like ties and pocket squares that match the style of the suit. It's not likely that anyone, other than us completist psychos, require all three Johnny's. But everyone is going to probably have a different favorite, and having three like this gives you the buyer the opportunity to pick up the one that floats his or her boat. For me, the wedding singer, tux style paint scheme works the best. 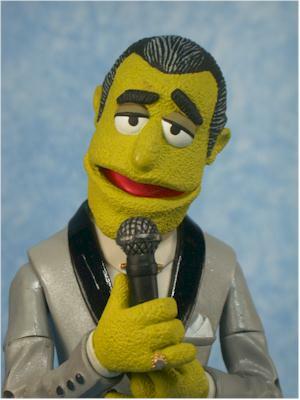 It looks the most like a lounge singer to me, and the color combination stands out great with the green skin color. The articulation varies across this series, with Smollet and Johnny having the most at 16 points. Johnny really shines in this category due to the ball jointed neck. This single detail gives him a tremendous number of posing possibilities, and combined with the ball jointed shoulders, cut biceps, elbows, wrists, hips waist and knees, there's not much you can't do with him. Okay, you can't have him sit on his stool, but that was never the intention. Smollet sports the same level of articulation: neck, ball jointed shoulders, cut biceps, elbows, wrists, waist, ball jointed hips, and knees. I had a little more trouble getting him to stand than I expected - the center of gravity was a little off - but he does have the most articulation of any regular release Kermit. Then there's Beauregard and Robin. They have fewer points, mostly due to the basic design of the characters. Robin has neck, ball jointed shoulders, cut arms at the sleeves, cut legs at the shorts, and waist. Beau has a ball jointed neck (although with less range of movement than Johnny), ball jointed shoulders, cut biceps, elbows, wrists, waist, and hips. 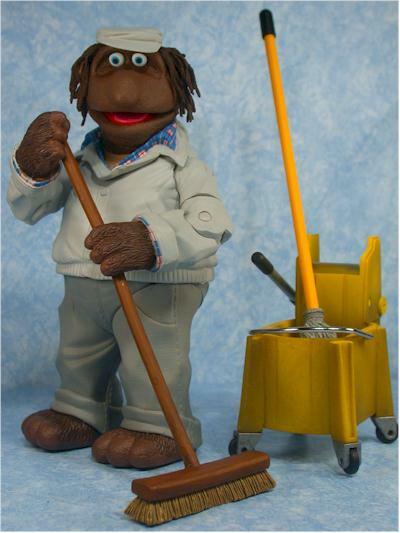 The most important pose - with the broom or mop - is easy to produce, and he stands great on his own. I did notice a little gapping at the hip joints on some of the Beau's in the case, but it wasn't terrible. It seems like Palisades out does themselves every time in this category. The quality and variety of the accessories is really amazing. There's that word again! Lets start with Beauregard this time. He has his hat, with a decent magnet to hold it on his head. There's also a broom and mop, either of which he can hold in his hands in a proper pose. Then there's the mop bucket with ringer - the ringer actually moves realistically, fits on one end of the bucket and can be removed, and the bucket has a metal handle and rolling wheels! Next up is Robin. He has a huge trunk, that even he can fit in, with a set of neat stickers to apply to the outside. These stickers fit the overall 'camp' theme perfectly. 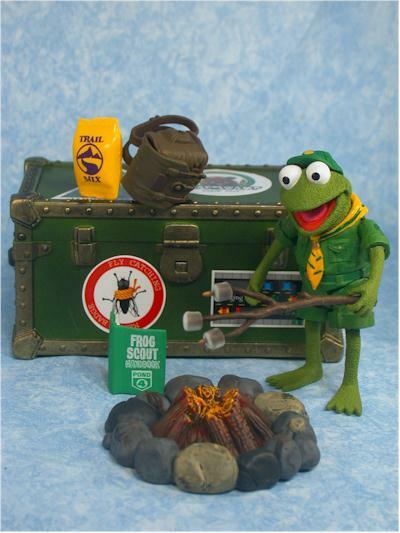 He also has a campfire, backpack that fits nicely on his back, Frog Scout handbook that opens and fits inside the backpack, package of Trail Mix, and best of all, a stick with half toasted marshmellows. 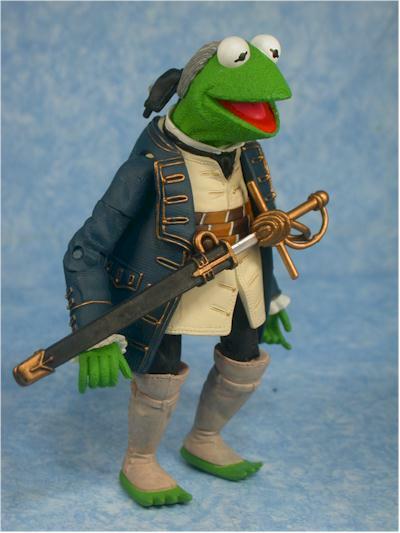 Smollet has the fewest accessories, but also the only one that has an accessory that counts as another figure in itself. 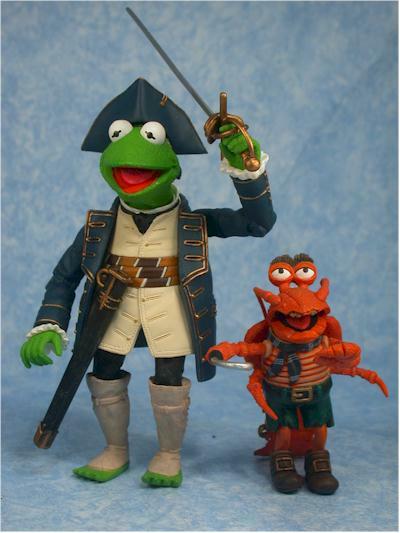 He comes with Polly Lobster, who is scaled fairly well, with an excellent sculpt and paint application, and even one point of articulation at the neck. He also has a sword and scabbard, and a hat. The hat doesn't fit on the head quite as well as I'd expected, but the magnet is nice and strong. The sword and scabbard look great, and there's a peg on the front of his costume to hold the scabbard, but I couldn't get my sword to fit all the way inside. I suspect there's some left over spru or plastic inside the scabbard that's blocking it. Finally, there's the Johnny triplets. They each come with a microphone, stool, record and sleeve, and photo in a frame. The microphone, stool and frame are all painted slightly different colors, while the photos are all different - Sal, Johnny and Johnny's mom - and the album sleeves are all for different albums. The only accessory that's identical between the three figures is the album itself. Do you need three Johnny's? No, probably not, but if you are buying them, they've at least taken the time to change up the accessories enough to make it interesting. 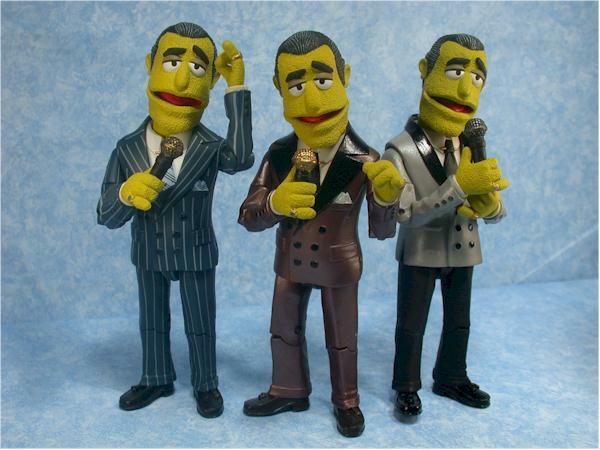 This is slightly qualified four stars - if your kids love Muppets, they'll love these figures. They have everything a kid could want, including great sculpts, articulation and accessories. At about $9, or $10 SRP, these aren't a penny pinchers dream. But they are a solid value, at a solid price point. I felt no pangs in my wallet when I paid for the full set. I also want to point out that people better appreciate what they are getting for ten bucks, because with the continued decline in the number of retailers, the prices for high quality specialty figures like this have only one direction to go. Either the prices will rise, or the figures from companies like Palisades, Mezco and NECA are going to have to change in quality. There are two sure signs that a set of action features are stupendous - one, I can't wait to write the review, and two, it's simply not possible to take a bad photo of them. 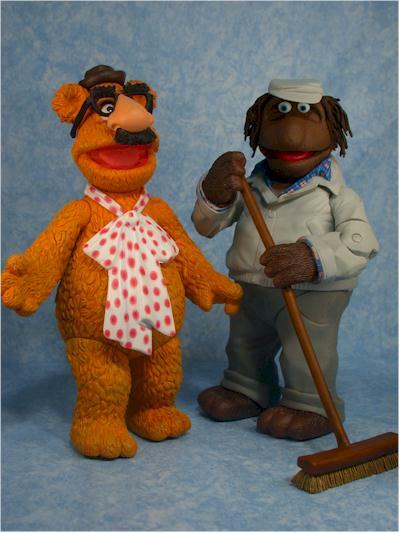 This set of Muppets fulfilled both requirements. Not everyone is going to want all three Johnny's, and since two are repaints, they technically get a half star less each. The problem is, which ones are the two you don't need? That's going to depend on which Johnny you prefer, and that's the one that gets four stars. Let's just keep our fingers crossed that we see this line last at this level of quality and diversity for another 7 waves! - Southern Island has the set of four available for $40. - Killer Toys has the set of four for $37, or the set of six for $54.95. 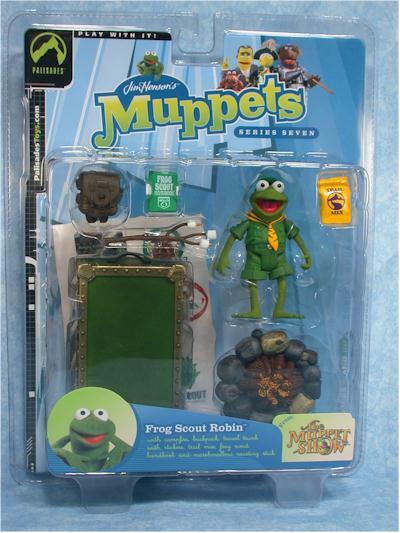 - Electronics Boutique has some of them available as individual figures for $9 each.